One pot cooking with a ProCook steel steamer is great for when you are in a hurry or preparing something healthy, especially when it comes to cooking for just me and the two girls. Being able to add a steamer section to a stock pot means that vegetables or foil wrapped fish etc can be cooked at the same time as the main meal. My one pot favourite is salmon and asparagus which is super easy in a steel steamer, all you need to do is pop the salmon into a little oiled foil with salt and pepper. Wrap it up like a parcel and pop it into the steamer section before placing above boiled water. After 15 minutes place the asparagus into the boiled water and cook for 5 minutes. One meal, super healthy and very little washing up too – which lets be honest is the worst part about cooking! 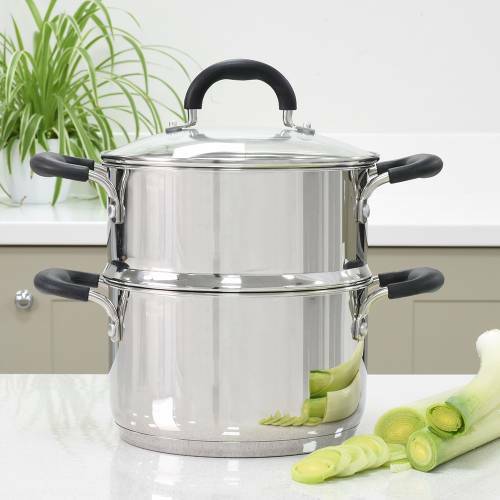 This ProCook gourmet steel steamer set has a 20cm pan with 3.8l capacity once the steamer is attached, silicone stay cool handles and is suitable for all hob types. ProCook always come with a 10 year guarantee and I have to admit I have cook wear that is way older than that and still looks the same as it did the day I bought it! I have been lucky enough to be able to offer one of my readers one of these fabulous pan sets of your own! All you need to do is enter via the Gleam widget below. Good Luck! The ProCook Gourmet Steel Steamer retails at £49 and if you spend £50 online you get a free X50 Santoku Knife worth £48. I was kindly sent one for the purpose of this review, all views and opinions are my own and genuine. How To De-stress At Home WITH KIDS!